Planning configuration and Process is very much needed in any business to get best results.The SAP helps you for this with different kind of tools in the software module Controlling. Having configured your system so that all actual (as opposed to plan) transactions run as you require, your project team now turns to configuring the planning functions.The project team has decided to plan its enterprise data as recommended by SAP. You want to run this process in test mode first. To simplify and hasten the entry of planning data, you want to implement different aids to planning in the future.To optimize data entry, you consider creating enterprise-specific planning layouts. To achieve these goals, the R/3 System offers a wide variety of options from which to choose. consistent if you use the version in different applications, for example in both Overhead Cost Controlling and in Profitability Anaylsis (integrated planning).You define Controlling versions centrally and add application-specific settings for Profitability Analysis, Profit Center Accounting, and Overhead Cost Controlling.You can plan your cost centers in as many CO versions as you wish. Each version in the R/3 System is tailored to particular planning requirements.When you create a controlling area, the R/3 System automatically creates version 0, valid for five fiscal years. You can also create alternative versions for, for example, positive or negative scenarios.When referring to actual postings , the R/3 System always uses version 0. Alternative versions can relate only to saving planning data in Cost Center Accounting. You may select any set of values. For example, you may limit the selection of data to a particular cost center, or you can select all cost centers. You can also choose to copy all plan data, or select only particular types of planning data. With the Revaluation planning tool you can increase or decrease planning results on a percentage basis. Therefore you can combine the Copy Planning and Revaluation functions to create several plan versions. This may be useful after copying the plan data from the previous year or for producing best-case and worst-case scenarios within a year. Plan line items are recorded during revaluation execution.You may undertake as many revaluations of cost center and cost element planned values as required.The percentages within a revaluation can be changed as often as desired. Repeated executions with changed percentages cancel the old plan line items and always use the original initial value. The percentage method is used to determine accrued costs on the basis of a percentage rate applied to a reference cost element or group of cost elements.The advantage of this method, when compared with accrual calculation using a recurring entry in FI, is that accrued costs are determined on the basis of actual costs. The percentage method is useful, for example, in accrual calculation of non-wage labor costs such as vacation bonuses.In accrual calculation, the amounts of the accrued costs are debited to the cost centers. Simultaneously, an accrual object defined by you (a cost center or internal order) is credited. The actual costs are also posted on the accrual object in order to calculate, analyze, and allocate any balances between expenses from FI and accrued costs from CO.You create an accrual cost element (cost element category 3) to process the accrual calculation. In addition, you must create an overhead structure that defines the various components of the accrual calculation, and identifies the accrual object that will be credited as each periodic posting is made. 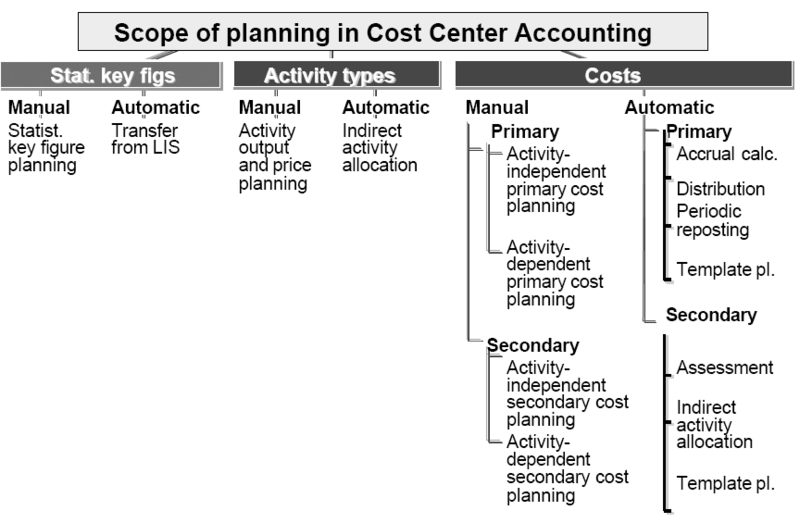 - The value and quantity-based cost planning of primary and secondary costs, as well as Revenue planning. For each planning area, you create at least one planning layout. You can use planning layouts to define the characteristics (cost center, cost element and so on) for which you want to enter plan values, and set up the appropriate value columns. SAP provides numerous predefined standard layouts.You use planner profiles to control the planning process. In a given planner profile, you can assign any number of planning layouts to any number of planning areas.The R/3 System contains standard planner profiles and standard planning layouts that cover almost every conceivable planning situation. You can use the SAPALL planner profile to plan for the three planning areas using a number of SAP standard layouts. SAP provides the planner profile SAPEASY for situations where a simple planner profile is required. You can also define your own planner profiles. 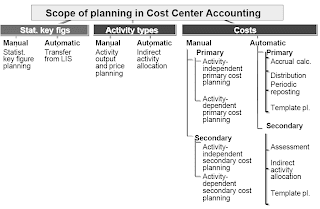 You can carry out both centralized (planning of a single cost element for all cost centers for example) and decentralized planning (for example, planning of all cost elements on a single cost center). The type of planning depends on way your company is organized. You can combine both methods, enabling you for example to plan your personnel costs centrally, and have all other costs planned locally by the cost center managers. To enable easy and ergonomic entry of the planning data, structuring the planning layout is very flexible. You can use the Report Painter to define planning layouts. This transaction corresponds to creating reports with the Report Painter.A planning layout contains a header and several lead and value columns. You enter the selection criteria in the header, and specify which characteristics are displayed in the header area. The characteristics are predefined in the SAP system for each planning area. In the lead column, you define the characteristics that you want to plan for. In activity-independent cost planning, you only require a lead column for cost elements. For activity-dependent cost element planning, you need to define two lead columns, one for the activity types, and one for the cost elements. - You can create columns either with a key figure and with characteristics, or with characteristics only. Key figures are included in your standard SAP system. Fixed plan costs are an example, or variable plan costs in the controlling area currency, consumption, price and total actual costs. - A formula column is a value column that consists of values from predefined columns. - In an attribute column, you can choose the unit, the distribution key, and the activity attribute. The unit and the distribution key should be created as an additional field for a column.